Cold weather has never been my friend. We’re into February, and all I can think about is counting down the days until summer produce and sandals. I can’t exactly escape the cold living in Minnesota, though. If it has to happen, bring on the low carb comfort food. It’s like an obsession every year. 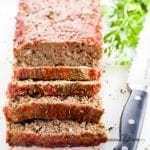 In addition to the classic low carb soups and casseroles, a keto low carb meatloaf recipe definitely makes the list. This paleo meatloaf turned out to be a hit in my family. Believe it or not, that’s actually saying something. First of all, meatloaf is one of those foods that unequivocally tastes much better than it looks. Brown foods are more difficult to make presentable in general, not to mention the bad reputation meatloaf gets sometimes. In some ways, getting someone to try it is the hardest part! Besides, my family presents their own set of challenges. My toddler is going through a “no phase”. The answer to every question under the sun is “no”. Food is certainly no exception. I wonder how long this is supposed to last? Still, if you ask my husband what his favorite foods are, he’ll throw out comfort foods like paleo pizza or cheeseburger casserole and, maybe a bit surprisingly, meatloaf. As for my daughter, she gobbled up a big plate of this keto meatloaf without protest. I’ll take it, even if it was between “no” exclamations! Since this low carb meatloaf recipe is one of our family favorites, I figured I had to share it for all the rest of you hearty food lovers. For all those “meat and potatoes” guys and gals, this dish is where it’s at. It makes such a satisfying dinner on a cold day! We don’t usually eat potatoes around here, though. Instead, we love our keto meatloaf with some brussels sprouts au gratin or simple parmesan roasted broccoli and cauliflower. Almost any side dish you like will go well with it! 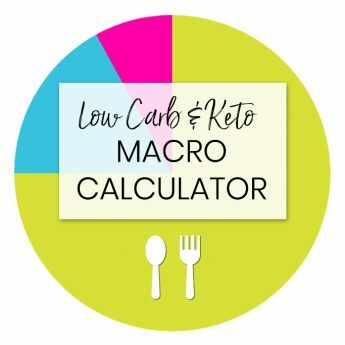 If you want to simulate the meat and potatoes concept while staying low carb, try mashed cauliflower instead. If you want to try a different recipe, you can try this version of paleo meatloaf with gravy! Just a quick word of warning – keto low carb meatloaf is very tender. It can be a little challenging to cut, so make sure to let it rest for 10 minutes before slicing. Cut carefully using a sharp serrated bread knife, not a chef’s knife. Avoid overworking the meat when mixing the ingredients, too. Doing so can make the loaf more prone to falling apart. It may also affect the taste and texture. This pretty much applies to any recipe that uses ground beef. 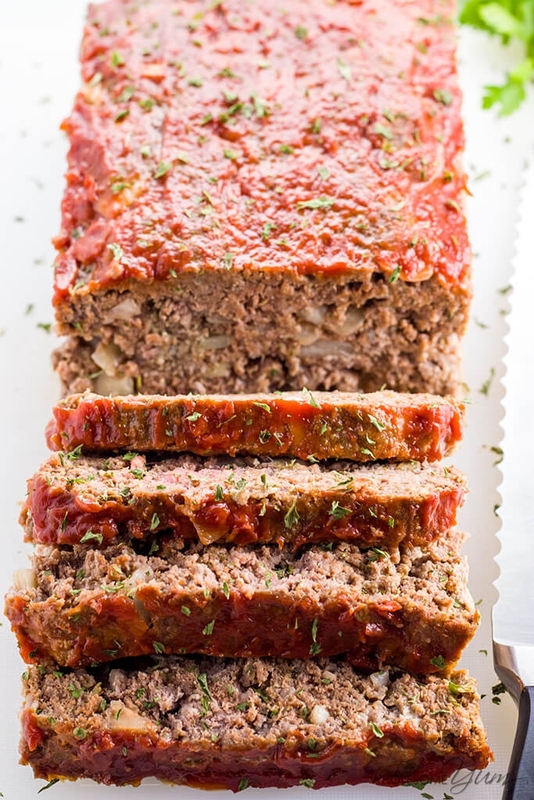 You can easily make this keto meatloaf in advance! If you’ll be eating it within a few days, it stores just fine uncooked in the fridge. Cover the surface very tightly with plastic so that the meat doesn’t oxidize. Otherwise, you can freeze it for longer. Both ways make meal prep on a weeknight a breeze. Even though it takes a while to cook in the oven, the prep is pretty quick. And, having it ready in advance means you can stick it in the oven while you go do something else. 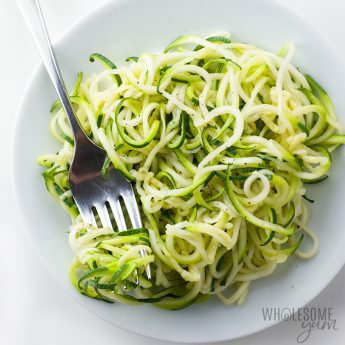 Can’t go wrong with time saving low carb recipes like this! Binding Keto Meatloaf: Almond Flour, Coconut Flour, or Flaxseed Meal? Many low carb meatloaf recipes are made with either almond flour or coconut flour. And when I first began my journey of how to start a low carb diet, keto meatloaf was one of the first things I experimented with. I originally used golden flaxseed meal instead, because it binds better than the other two. It also happens to be the lowest in net carbs. You can use regular flaxseed meal if you want to, but the golden kind is more mild, with a better flavor. If you prefer your paleo meatloaf to be even more sturdy, there’s one modification to consider. Simply increase the golden flaxseed meal amount to 2/3 cup. This makes it slightly less tender, but easier to cut without crumbling. I think it’s delicious both ways! 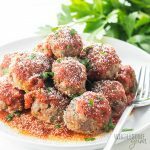 All of this being said, I have since tried making this low carb meatloaf recipe with almond flour. And I have to say, I do prefer the texture of almond flour over the flaxseed meal. It’s up to you which way you want to make it. If nuts are not a problem, I would now probably recommend to use the almond flour if you can. Don’t forget the sugar-free ketchup on top! Loaf pan – Great for everything from meatloaf to paleo keto bread! Meat temperature probe – To get your meatloaf to just the right temperature easily. It’s ready to remove from the oven when it’s at 160 degrees, and will rise another 5 degrees while resting. Preheat the oven to 350 degrees F (177 degrees C). Grease a 9x5 in (23x13 cm) loaf pan and set aside. In a large bowl, combine all ingredients except ketchup. Mix together until well incorporated, but don't overmix. Rest for 10 minutes before slicing. Cut carefully using a serrated bread knife (not a chef's knife). Click or tap on the image below to play the video. 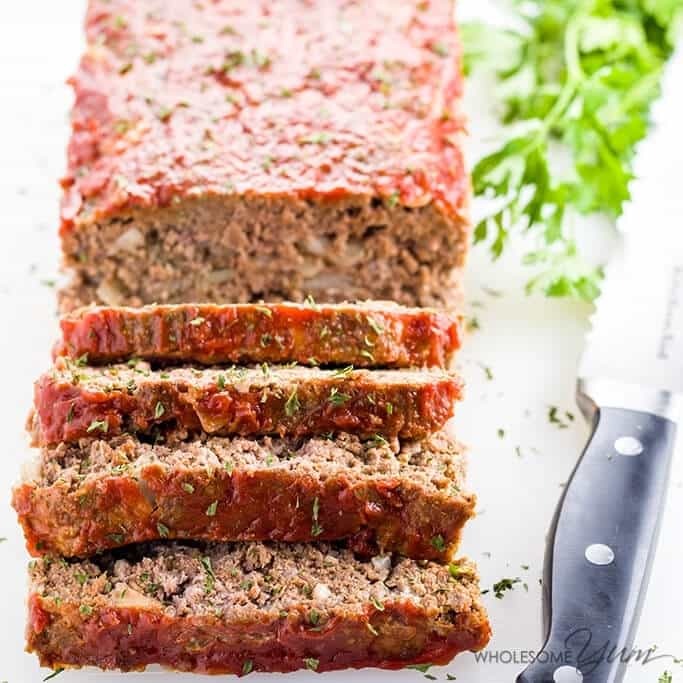 It's the easiest way to learn how to make Paleo Keto Meatloaf! I love this recipe. I’ve made it a few times. The only adjustment I make is I use 1/2 a teaspoon of sea salt rather than 2 teaspoons. I really liked it. I used 1lb meatloaf mix of meats + 1lb 85/15 ground beef. I cooked onions, bell peppers and garlic just long enough for them to become aromatic. I used a little less onion than stated but I did add onion powder. As to almond flour or flaxseed meal, I used both. I used 1/2 cup flaxmeal and 1/4 cup almond flour approximately. Came out firm enough to cut easily (I actually used my egg flipper (spatula) to cut the slices…aim it straight down tip of spatula aimed at top of meatloaf and cut, if that makes sense. It was nice and juicy also…thanks so much for sharing your recipe. Oh, i only had 1 fresh garlic clove…a pretty big one and then I added some garlic powder. So yummy served with turnip hash brown and a few steamed and buttered asparagus spears. Best meatloaf I’ve ever made Keto or not. Hello, I was wondering if this would freeze well after cooking and slicing? I’m trying to come up with ideas to make homemade “tv dinners” for my elderly mother that she could reheat in the microwave that are healthier than the store bought ones. Any ideas? Hi Diane, Yes, you can definitely freeze slices! Great idea! Really tasty recipe and loaf held together surprisingly well (used the flax meal option) when I took it out of the loaf pan. Didn’t have an Worcestershire sauce so subbed it with soy sauce and added a bit less salt to compensate and turned out great. Will definitely make again but I think I’ll pre-cook the onions and garlic a bit first to soften them up before adding them to the mix, they were just a bit firmer than I would have preferred in the cooked loaf. I appreciated the options for different low-carb flours included in the recipe! thanks for posting! Hi Cecilia, Yes, you can do that! It sounds delicious! I will be making it for supper, thank you. Do you ever lose patience with all the questions about how to change the recipe? I’m pretty sure I would…That’s not even close to my recipe, but good luck to ya. So good! I used meatloaf mix (ground beef, pork and veal) and added a healthy dose of parsely. My wife LOVES meatloaf and this hit the spot for both of us! Thank you for this recipe! Loved it! Didn’t need the ketchup as far as I was concerned, had enough flavor and was nice and juicy. I used only 1.6lbs of 80/20 beef (all I had) and added maybe 1/2 Tbps ginger to the mix. Great idea to use ground flaxseed, too- would have never thought of that. Thanks for posting, we will make often. I don’t happen to have any coconut flour on hand. Is it possible to substitute quinoa for the flour? Hi Susan, This recipe doesn’t use any coconut flour (and I don’t recommend it for meatloaf, as it would make it very dry). This recipe uses either flax seed meal or almond flour. I haven’t tried quinoa, so not sure if that would work, but it would not be low carb, keto or paleo. I used 1lb elk burger & 1 lb beef burger. added 1small chopped zucchini, I used crushed pork rinds instead of the flour & spicy brown mustard for the topping..the meatloaf was really good!! 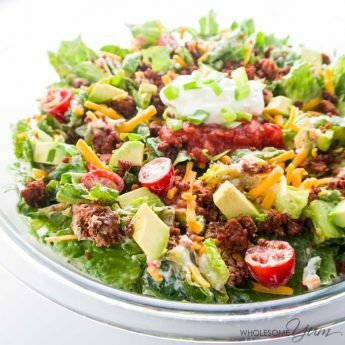 Have you ever tried using ground Turkey? Wondering if it would be too dry? Hi Anne, It should work fine with ground turkey. It might be slightly more dry than beef, but I don’t think it would be so dry that it’s not good. I recommend lining the loaf pan w/ plastic wrap and use it as a mold, then remove the molded meat to a flat pan so the loaf is free standing and you can glaze all sides instead of just the top. Tasted great! I added a little heavy cream and some feta cheese, and it’s amazing! Thank you! My kids gobbled this right up, it was so good! This recipe is definitely a keeper! Wow, this is so juicy and delicious. Loving the pro tips too. Thank you for this recipe! I’m looking forward to trying it this week! Question: I only have glass loaf pans. 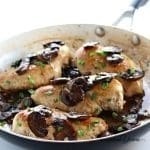 Will that make a difference in the taste or timing of this recipe? I can get a metal loaf pan if necessary, but I wasn’t sure if that was needed. Thanks! Hi Catherine, You can use a glass pan. The baking time might vary a bit, so use a thermometer to make sure it’s done. Omg just made this and it was amazing!! Thanks so much for the recipe 🙂 I did add two teaspoons of sambal oelek aka spiciness to it, which definitely gave it an extra kick. And think the quality of the meat I used (organic, grass-fed) also made a huge difference. This looks delicious – I understand why your family liked it! Instead of flax seed meal or almond flour, I use crushed pork rinds to bind the meatloaf. Zero carbs and cheaper. I also added many more veggies to my meatloaf; chopped celery, red, green, yellow pepper, scallions. Sounds delicious. Thank you for sharing, Linda! Hi, what is the percentage of the ground beef? I like to use grass fed beef but I know that can be more tough. There is a Us Wellness Meat that is 55% lean I use. Any recommendations? Hi Thuy, You can use any kind you like. I usually use either 80% or 85% lean, grass fed, and it doesn’t come out tough or dry. This looks really good! I have made a Keto meatloaf many times and instead of using almond flour, I used grated Parmesan cheese. It tastes treat, and works great as a binder and the meatloaf is pretty easy to cut. Also, I use Lipton Onion Soup Mix in mine instead of Italian seasonings and it is wonderful! Donna, I used to use the onion soup mix years ago in meatloaf, and it is really delicious. But look at the carbs it adds! That number isn’t for what’s in the packet, it’s just for 1/4 packet… The Italian seasoning adds nearly no carbs. I am new to the keto diet and this meatloaf has helped me along! It’s so good! I did do a substitute. I used ground turkey and ground deer meat in place of beef and left out the tomato paste. I didn’t have the tomato paste when I first made it. I also used almond flour. I am making it again today! Thank you for sharing this yummy dish! I make this with Venison and to add a little more fat, I weave bacon around it and I also add some cheese, it makes a great tender meatloaf. Really tasty, I used the ground flaxseed and it had a nice texture. I found it to be too salty however. I will omit the salt altogether next time. I think the Worcestershire sauce is salty enough. Thank you so much for this recipe! First time making meat loaf, it was so easy and delicious. I used almond flour. My husband, 1 year old and 3 year old loved it ! I made this today with almond flour and I substituted sugar free ketchup for BBQ sauce. Yes this was a little crumbly but the flavor is fantastic!!! I paired this with my favorite mashed cauliflower recipe and I can’t tell it’s not the real thing!! Great recipe. It was delicious! We all loved it! I used flaxseed and baked a little longer to have a little drier consistency. Loved the recipe, all I changed was using 1/2 Tbsp onion powder (husband hates onions, but he’ll tolerate the powder), and 1tsp garlic powder. I used the almond flour instead of the flaxmeal. And I know it’s not keto, but I did add 1 Tbsp regular ketchup to the top, but no more. Everyonehere loved it, and I’m the only one keto. Thanks. Great recipe and mine turned out great. However, since I am keeping close track, I would appreciate a more precise serving size. One 3/4 inch thick slice could be many things. I could have a 3/4 inch slice that was 6 inches long or a 1inch by 1 inch slice that was still 3/4 inches thick. I say this because even though I made this full recipe I only baked some of it and froze the remainder. I couldn’t cut the meatloaf into even portions. Could you give me a serving size in ounces? Thank you. Hi Dona, I’m glad you liked it. The serving size of a 3/4 inch thick slice is based on the pan size specified in the recipe, 9×5 inches, so the size of the slice is 5 inches long by 3/4 inches thick, and the width would be the height of the meatloaf you made. If you need a precise weight, you can definitely weigh that slice as well, or weigh the whole loaf and divide by the number of servings to get the weight of one serving. Hi! Would this work with coconut flour? How much? Hi Holly, No, sorry that would make it too dense and dry. Hi Mary, No, sorry, coconut flour would be too drying. Hi! I would like to make this recipe using the muffin sheet. Have you tried it? Hi Lorena, I haven’t, but it will definitely work. The baking time will be reduced a lot. Made this last night and it was amazing. Meatloaf is a big deal in the south and this recipe nailed it. Unfortunately I didn’t get 12 servings. I got roughly 8, I believe this was due to the fat cooking off. I used 73/27 beef because I am Keto and need the fat. I also drain midway through and baked an additional 10 minutes for texture reasons. I am happy you liked the meatloaf, Tiffany! Thanks for stopping by! Have you made this with Panko and how much would you use? Hi Wayne, I haven’t. 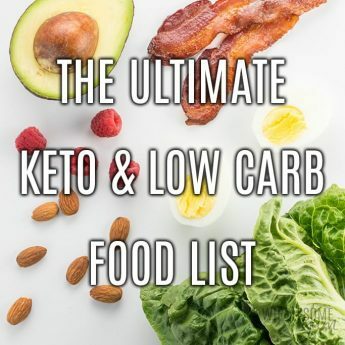 It wouldn’t be low carb, keto, paleo or gluten-free, if you are looking for it to be any of those. If you just want to make regular meatloaf, Panko breadcrumbs will work fine. Delicious and moist. Thank you for this great recipe. I am so glad to hear that, Diane! Thank you! Can crushed pork rinds be used instead of almond flour? If so, how much would you recommend? Hi Audrey, Yes, you can use the same amount. I am so happy you liked the meatloaf! Have a great day! Excellent recipe! I love the taste!!! I am so happy to hear that, Rosetta! Thank you! I love this recipe! I use this recipe all the time! I am so happy you liked the meatloaf, Vickie! Please come back soon! This meatloaf is so good!! My kids and I loved it! I am so happy you and your family liked the meatloaf, Jenna! Thanks for stopping by! Amazing meatloaf. I made it about 3 weeks ago for the 1st times. Even my picky 13 yo son loved it. In fact, he asked me to make it again for dinner tonight, on the way home from school today. The key is to not over mix it. Also I like mine a little crispy on the outside, so I added 6 min cooking time to give it just a touch of crispiness (no mushy meatloaf for me). And I used almond flour. Truly turned out perfect & was easy to slice & serve. Made exactly 12 servings. I actually divided mine into 2 regular size loaf pans. I love to hear that, Lori! Thanks for stopping by! This meatloaf was awesome! I made it about 3 weeks ago. Even my (picky eater) 13 yo son loved it. In fact, he asked me on the way home from school if I’d make it for dinner tonight. The key is to not over mix it. It made 12 equal servings. I divided mine into 2 regular size loaf pans. Also cooked it about 6 min longer to add a crispy layer to the outside, which also kept it from falling apart. I am so happy you and your son liked it, Lori! Please come back soon! Is golden flaxseed meal the same as ground flaxseed. If not, can it be substituted in this recipe? Hi Marian, They are almost the same. Ground flax seed and flax seed meal are the same. Golden flax seed meal is ground flax seed made out of golden flax seeds instead of brown. The taste is better, but either one will work. Otherwise you can also use almond flour, which I actually prefer now. Thanks for the tips about golden flax seed, but where do I find the nutrition info for the meatloaf? Hi Judy, The nutrition info is right on the recipe card above. Wish I’d only used 1 tsp salt… way too salty! Will try again. Hi Betty, Sorry to hear it was too salty for you. I use Julia Child’s recommendations for salt – 1 tsp per pound of meat – but if you like it less salty, feel free to adjust. 1/2 a cup of golden flaxseed meal has 16 grams of carbs. How can the entire meal have only 5 grams of carbs? Thanks for stopping by, Khaled. 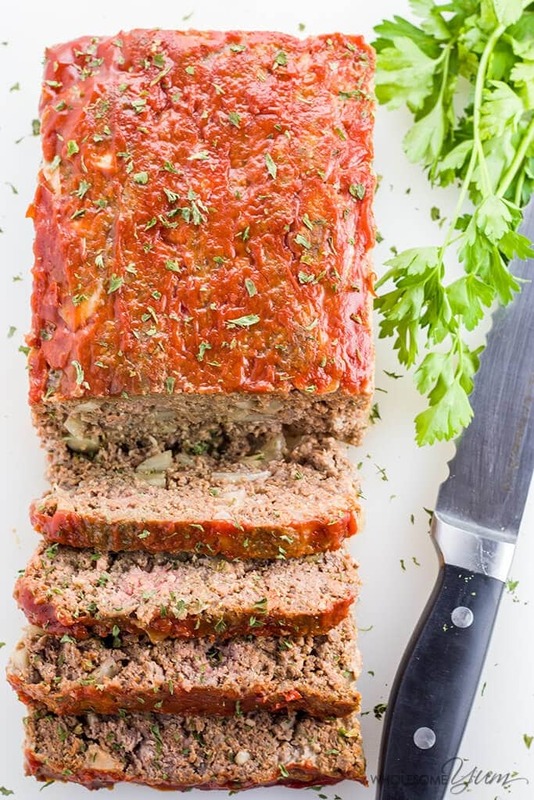 There are 12 servings in this meatloaf so that is why there are 5 grams of carbs per serving. Have a great day! No indication what ratio of ground beef. Two, never has any meatloaf, including yours, comes out nice and not fall apart. Thirdly this does not make 12 servings. I use a normal size pan for meatloaf. We have 7 people living here. 5 kids two adults. Hi Natalie, You can use any ratio you like. There are definitely stabilizers that can be added to make meatloaf more sturdy, but I prefer using natural ingredients and don’t see an issue with it being a little fragile. It does make 12 slices that are a serving each, but of course the amount a person would need will vary based on so many factors like appetite and what else is being served. You can certainly eat more than one serving if you want to. 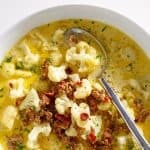 Can you cook this in an instant pot?? Hi Stacie, Possibly, but I haven’t tried it. Let me know if you try it. Just wondering if anyone had made this recipe using pork rinds for the binding agent? Hi Margaret, I haven’t, but you probably can! If I were to cook in muffin tin, do you know what the cook time/temp would be? And how many would equal a serving? Hi Vicky, Sorry, I don’t have the cook time for making this into low carb meatloaf muffins. It would be much less than a whole loaf, though. Serving size would depend on the muffin size and what else you have with them. This is a good idea. My muffin tin makes 12 muffins, so it would automatically be divided into servings. I think I’ll try that and figure out the cook time with a thermometer. Bonus is that fragility won’t be an issue. Meatloaf was delicious. I followed the recipe to a T and it turned out great! This one is a keeper for sure. I a so happy to hear that, Lucy! Have a great day! Recipe held up great with almond flour. I would recommend sautéing the onions and garlic before baking. I also broiled some mozzarella on top at the end! Topping it with mozzarella sounds delicious, Erika! This recipe is delicious! I used regular flax and did not take the tip about using more for a more firm result. That combined with the fact I couldn’t wait to dig in resulted in my meatloaf being pretty crumbley. But it’s just me, so I don’t mind. I made 2 small loaves and topped one each with sugar free ketchup & sugar free BBQ. Nice to have something that I can eat hot or cold and already prepared. I will absolutely prepare this recipe again! I love to hear that, Billy! Thank you for stopping by! How about changing it slightly to 1 lb beef, 1 lb pork? Hi Mike, You can definitely do that! I made a small batch–half with ground flax seed and half with almond flour. Cooked them simultaneously, but the flax one was clearly done much faster. It’s been an hour and 20 minutes, and the almond flour one still looks raw. Any idea why? Sorry, I haven’t experienced that before! The time was pretty similar with both in my experience, but I didn’t make them at the same time. The only thing I can think of is, were they on different racks in your oven? It’s possible that the positioning affected heat distribution. I made this tonight using milled flax seed. It held together beautifully, but had a slimy texture when we were eating it. Is this normal? Or what did I do wrong? Hi Beth, Sorry you had issues with it. It might have needed to cook for longer, or it might be that you just would like the almond flour version better. The amount would be the same. Totally flamin perfect! My family couldn’t do keto w/o meatloaf! Came out a little less coherent and slightly soupy despite minimal handling, so we tried halving the recipe, doubling almond flour and still using 2eggs. Even my duck dynasty son ate a whole batch, sez it’s the best he has ever had. Thanks so much for a real winner!! I am so happy to hear that, June! Have a great day! I made it with almond flour, but it didn’t hold together very well, but IT WAS DELICIOUS and my family loved it! Hi Rena, I’m glad your family loved it! You can add more almond flour if you want it to bind a bit better, it’s just a balance between that and tenderness. I have probably made this recipe about 25 times over the last several months and never stopped to comment. Tonight I am cutting it in half to make meatballs. My kids are very picky and they devour these. My husband and I love eating these for snacks on the go or over a salad! Thank you for this WINNER of a recipe! I am so happy to hear that even your picky kids liked them, Katie! Thank you! When cooking, do I need to cover the pan? Hi Kristen! You cook this uncovered. I hope you like it! Hi, I don’t have tomato paste. I have tomato sauce. Can I use that? Hi Julia, You can try, but I can’t vouch for the result. Tomato sauce doesn’t have the same concentrated flavor, so I think it would be better with the paste, but if all you have is sauce, it might not be a deal breaker. Buy your tomato paste in a tube or do what I learned from another blogger (haven’t done it yet). Freeze your tomato paste in 1 oz circles and then use them when needed. I want to learn how prepare good meals. I am a type 2 diabetic. Is there a phone number to speak to someone? And where do I buy the products? Hi Vennetta, Unfortunately I don’t have the capacity to offer phone support, but we do have a helpful support group here that you can join. All my recipes have links to buy the ingredients right on the recipe card. This meatloaf is outstanding!! I used almond flour and had only 4 garlic cloves on hand…it was bursting with flavor. To serve, I put a slice on top of fresh spinach and topped the meatloaf with about a quarter cup of mozzerella, then microwaved for 30 seconds. THANK YOU FOR ANOTHER WINNER!! Thank you so much, Wendy! After initially making it I do slightly prefer the almond flour version. The topping you used sounds great! You think this recipe can be made in the crock pot or even frozen? I’m having baby #3 in a few weeks and I’m getting some freezer or easy meals together. Hi Hayley, You can absolutely freeze it! I did the same when I had my youngest little girl. I’ve never tried it in a Crock Pot, though. How long should I cook if not using ketchup? Hi Ashley, The cook time doesn’t change if not using the ketchup. It’s still the same amount of time needed to cook through the meat. A meat thermometer is the most sure way to determine cook time, you want 160 degrees in the center. I have no flax seed or almond flour left. Can I use coconut flour or tapioca? Thank you. 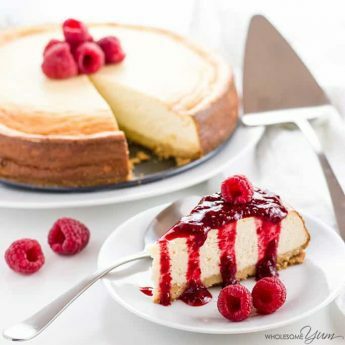 Hi, can this be made a few hours in advance (tightly refrigerated)? Or must it be made immediately before putting in the oven? Thanks. Hello there! Yes, you can easily prepare this ahead of time and then place in the oven when you are ready to cook. Thanks for stopping by! I hope you enjoy it! I have noticed that when I change the serving size, then click to print, it does not calculate the new serving size. The ready to print page has the original 12 servings. Might I be doing something wrong? Hi Johnathon, No, you are not doing anything wrong. That is a limitation of the website at the moment. I’m sorry. Also, for a meatloaf recipe, keep in mind that changing the servings will affect baking time. Is there something to use instead of golden flaxseed flour? 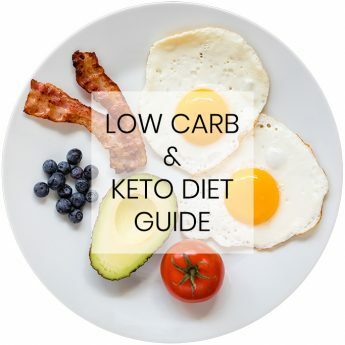 I am just starting the keto way and I have purchased so many things lately. I want to make sure I can keep up with the diet before I buy everything for different recipes. Hi Sandy, Yes! You can use almond flour. OMG. I’m very surprised. I was expecting a delicious outcome but didn’t like the ground flax! I tried slicing the meatloaf into thinner pieces, browning, adding spices, hot sauce, etc., but the flax! Sorry folks. 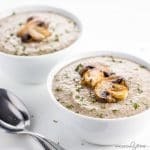 I don’t think it’s an acquired taste issue either because I use the flax in juices & other dishes & can easily handle it as well as plain unflavored psyllium and similar things. Great website & recipes in general – for me though, not *this* one. Hi Bill, Thank you for the feedback. Sorry that it wasn’t for you. The flax might be an issue if the meatloaf isn’t cooked through enough. But if you still don’t like the flax in there, try making it with the same amount of almond flour instead. Hi! I was really wanting to try this recipe! Big fan of yours! I have already tried a lot of your recipes. Never a disappointment! Thank for helping us become healthy, you have made life more enjoyable for us! I was wondering if I could ask something from you. Could you possibly give me an ingredients measurement for just one pound of meat, please? There are only two of us and two pounds would be a bit much. I understand you are busy and I appreciate your time! I am not really good at measurements and winging it. Still very new to cooking. Hi Victoria, if you go to the recipe card you can change the number of servings to however many you want! 🙂 Of course, baking time will be shorter with fewer servings so be sure to watch it closely. This turned out really slimy. So I’m hoping frying it will fix this. Hi Diana, Sorry that happened – that indicates that it wasn’t cooked through enough. I’d recommend using a meat thermometer to make sure it’s done. Hi Toni, the serving size in one 3/4″ thick slice of the meatloaf. What about blooming some unflavored gelatin in the eggs/liquid to help prevent crumbling without adding extra flax meal? Hi Arielle, What a great idea! I haven’t tried that. Let me know how it goes if you do! I prefer to use “pork rind dust” as a substitute for breadcrumbs. You make them by smashing pork rinds or processing them in a food processor. I’ll have to try that sometime! You mention ketchup in the directions but I don’t see that as an ingredient. Are we making ketchup? If so what ingredients on the list make it? Hi Kim, Ketchup is listed as an optional ingredient – it’s the last one on the ingredients list. You can make your own sugar free one, but I haven’t posted a recipe for it yet. You can use any ketchup you want, or omit it if you’d like. You’re welcome! I ended up using pecan meal instead & it worked great with the combination of elk & wild boar ground meat that I used. I think any nut or seed meal will be fine if you don’t have the flaxseed on hand. Looking forward to trying more of your recipes! I’m glad you liked it! Good to know that the nut meal worked out, too. Thank you! I haven’t tried this one with almond meal, but think it should work. Let me know how it turns out if you get the chance! The sassy “No” phase, I remember it well! My son would not touch meatloaf until he was 10 years old. Now he loves it. Your toddler at least is more adventurous. Ahhh, the “no” phase! I remember it well. I didn’t like meatloaf until I was an adult. My mom had to put mashed potatoes in it and douse it in ketchup before I would take a bite. But, now I have found ways to make friends with meatloaf. This meatloaf looks appetizing. Looks good! I’m not much of a meatloaf person but I actually like the sound of how tender this is!